I have always loved Hydrangea Bushes, in fact I have the perfect spot for one outside my Kitchen window. Well it would be perfect if it were not for the mature Cala Liliy that is living there. Till I decide on another place to plant one I will just have to enjoy stamping one. This stamp is from The Crafters Meow, I paper pieced it with some white card stock that was sprayed with several shades of Lindy's Stamp Gang Starburst Spray in Jack in the Pulpit Teal and French Lilac Violet. Enough of the details, let me know if you have any questions. Till next time, Happy Stamping! 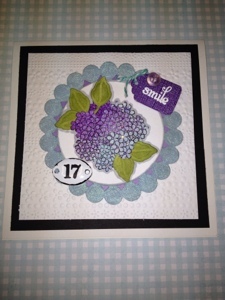 This is such a pretty card hunnie, Thank you for sharing with us at Make it Monday this week..
Hi Adrienne! This is a very lovely card! One that I wish I could hold in my hand and see it up close! Lots of pretty detail...love the embossed background and you've colored the hydrangea SO nicely! Thanks for joining our challenge this week at SSiC! This is such a pretty card; love the sparkle and the colors you chose for your card accent the main image so beautifully!! Wishing you a blessed week from SSiC!! Very pretty. I do love Hydrangeas myself either real or stamped. Thanks for playing along at Perfect Sentiment.